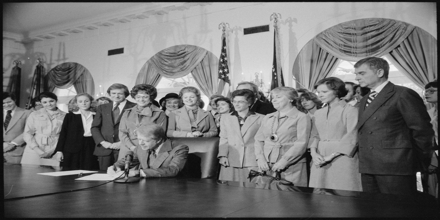 Equal Rights Amendment (ERA) was finally passed by Congress 49 years after it was introduced! ERA calls for equal rights for both men and women. It ensures equal funding for both male and female sports in schools. As a result, women and girls have more opportunities to participate in sports. The ERA was originally written by Alice Paul and Crystal Eastman. In 1923, it was introduced in the Congress for the first time.